Joint pain, also known as arthralgia, can be defined by soreness or discomfort in one or multiple joints in the body. Painful joints may be the result of a plethora of different conditions, injuries or illnesses, and effects range from mildly irritating, to agonizing pain resulting in impaired physical functioning. 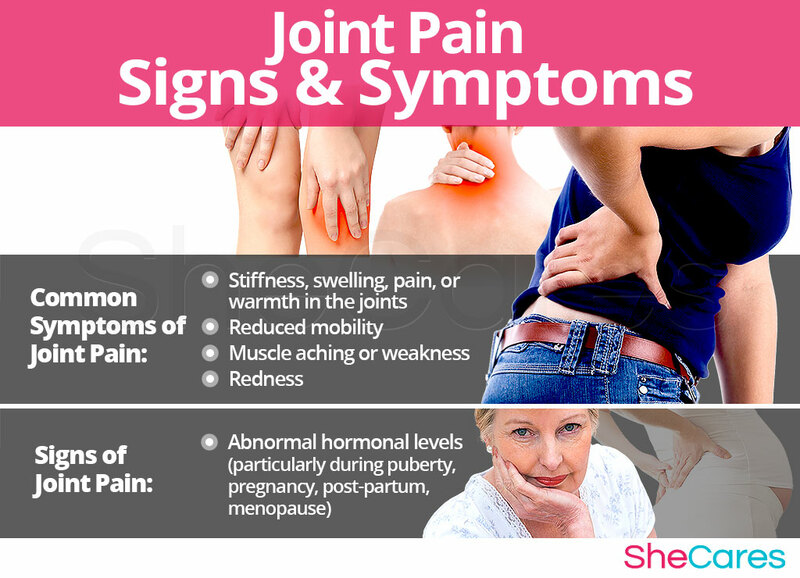 During puberty, pregnancy, postpartum (including breastfeeding) and menopause, significant hormonal changes take place in a woman's life, which can cause unpleasant physical symptoms, including joint pain. 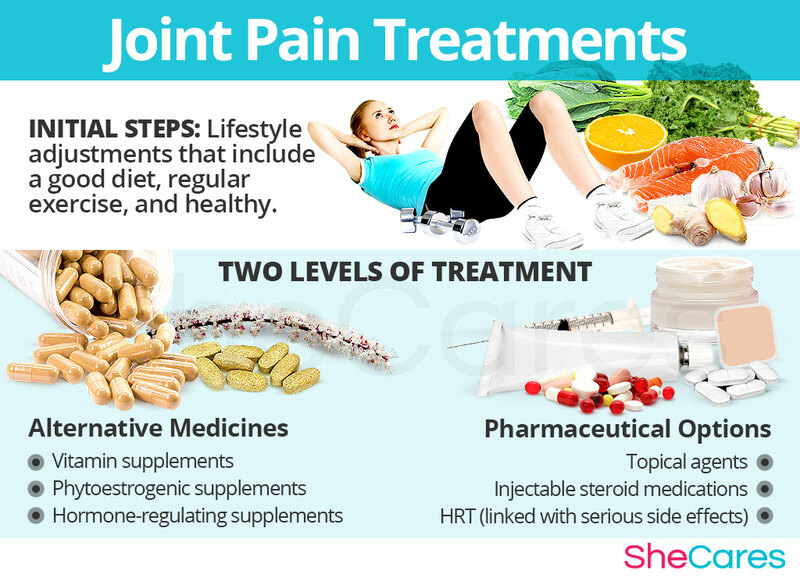 There are, however, a number of changes that a woman can make in order to decrease the impact of joint pain in her life. Continue reading to learn about joint pain, and the causes, risk factors, symptoms, signs, prevention and treatment options available. Pain can occur in any joint in the body. The most common reported joint pain is that of the knee, followed by pain of the shoulder and hip. Approximately 27 million Americans currently suffer from osteoarthritis - one of the most common causes of joint pain. Joint pain is an extremely common condition; a recent survey conducted by the Centers for Disease Control and Prevention indicates that one third of all adults living in America have suffered from joint pain within the last 30 days. Joint pain is twice as common in women as in men, and reports of joint pain increase with age. Joints form the connections between two bones. They also provide support, and help the body to move. When joint damage occurs, the result may be pain and or a loss of mobility. Joint pain is distinguished by discomfort, inflammation, soreness, aches, pain, warmth or stiffness in any of the 360 joints of the body. Contrary to common belief, joint pain is not inevitable with age, and is generally indicative of an underlying condition or hormonal imbalance, as with those that occur naturally during puberty, pregnancy, post-partum - including breastfeeding - and menopause. Once the root cause is addressed and treated, inflammation and pain generally subside. Joint pain may be experienced in brief periods and termed acute, or may be long lasting and chronic. Chronic conditions are defined by those lasting more than three months. Acute cases of joint pain may be triggered by certain conditions, like medications, smoking or an imbalanced diet, whereas chronic joint pain generally occurs alongside pre-existing medical conditions. Swollen joints is a problem commonly experienced by pregnant women. The new, extra weight can cause strain on the knees which might lead to swelling and pain, additionally symptoms of pre-existing arthritis can worsen at this time. It is advisable to talk to your doctor to gain advice about safe treatment during pregnancy. If you experience acute joint pain, the idea of exercising might be intimidating, or even impossible. It is worth noting; however, that exercise can be hugely helpful for relieving pain, and inhibiting the condition altogether, as it can help to re-strengthen the muscles, bones, and joints. Try gentle walks or swimming to start with. Regular exercise can also be very helpful for the relief of joint stiffness. While the thought of attempting any might be daunting, something as small as a gentle swim or walk can work wonders. Exercise can re-strengthen the muscles and joints, thereby improving stiffness and reducing pain in the long-term. 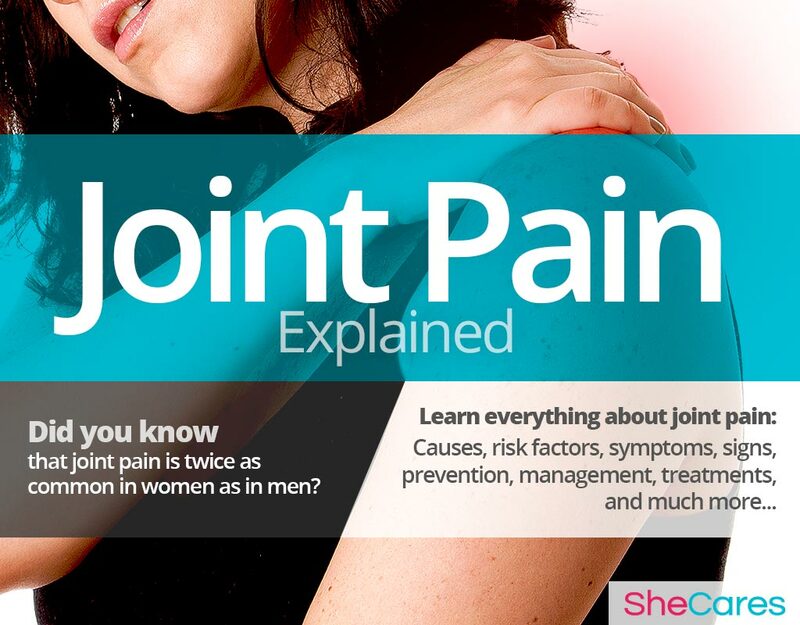 Learning about the causes of joint pain can help women to prevent or treat these instances. Joint pain is usually the symptom of a greater problem, such as hormonal imbalance, bone disease or arthritis. 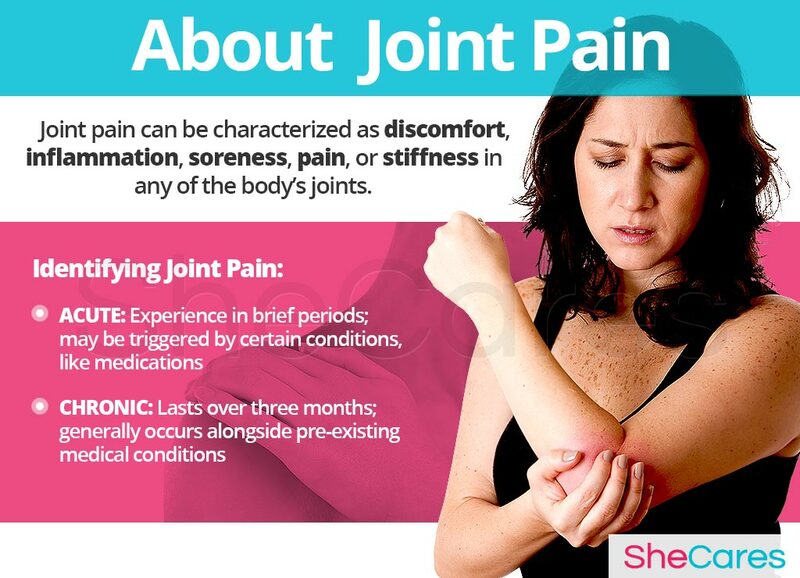 Brief episodes of joint pain can coincide with hormonal changes. Read on to discover the hormonal causes of joint pain. Hormones regulate a variety of bodily functions, like growth, sexual reproduction and brain function. Balanced hormonal levels are required in order for the body to function properly. Higher or lower levels of certain hormones can cause joint pain. Estrogen. During puberty, pregnancy, postpartum and menopause, estrogen levels in a woman's body are fluctuating. Low levels of estrogen can cause joint pain, increased risk of injury and bone loss, among other symptoms. Cortisol. This hormone works as an inflammatory agent, which means that is causes inflammation. It is also released in response to stress, which means that sustained stress causes inflammation in the body, and can lead to joint pain. Endorphins. Endorphins are natural hormones that create a sense of pleasure, and are the body's natural painkillers. For reasons unknown, these hormones are thought to work more effectively in men than in women. Pain researcher at Louisiana State University, Patrick Wood, MD, states, "Studies have found that females release less of the brain chemical dopamine in response to painful stimulation. Without dopamine, endorphins can't function effectively." Thus, women may experience any sort of physical pain more profoundly than men. It may be necessary to make lifestyle changes, or take supplements to lessen the effects of hormonally induced joint pain. Before treatment, it is important to be sure about what is causing this condition. Read on to learn about the other causes of joint pain. Although hormonal imbalance is one of the main causes of joint pain during a woman's reproductive life, the root causes at each stage of development vary. For example, during puberty, joint pain tends to be caused by something different than that during menopause. Puberty is the stage in which a girl's body begins to produce reproductive hormones; these and other factors, such as school and dating pressures, contribute to joint pain during puberty. Pregnancy leads to extreme changes in the production of reproductive hormones, which along with other factors, like fatigue or bodily changes, can lead to joint pain. Postpartum and breastfeeding is another stage where reproductive hormones are imbalanced, leading to symptoms including joint pain. Also, other factors contribute to joint pain during postpartum, like postpartum depression. Menopause is the stage in a woman's life when production of reproductive hormones naturally declines, signaling the end of a woman's fertility. As well as hormonal causes, other factors add to the reasons for joint pain during menopause, including the experience of other symptoms of menopause. While hormonal imbalance is the major underlying cause of joint pain during a woman's reproductive life, other less common conditions may also be the cause of joint pain. Some other causes of joint pain that are not related to hormonal imbalance are; past injuries, arthritis, fibromyalgia and osteoporosis. Although joint pain may occur naturally in periods throughout a woman's life because of a shift in hormones, it can also signify a more serious condition. Although the most likely cause of joint pain for women is hormonal imbalance, some women are more at risk of developing this condition than others. Keep reading to learn more about the risk factors for joint pain. 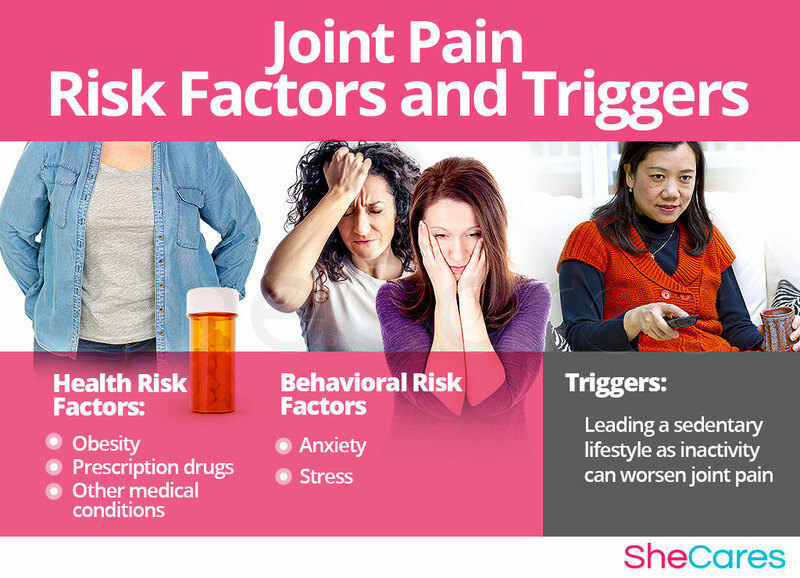 Some women are more likely than others to suffer from joint pain for inherent psychological, behavioral and health reasons. These predisposing factors can affect a woman's hormone levels and increase the chances that a woman will develop joint pain during her reproductive life. Continue reading to learn about the triggers of joint pain. In addition to long-term risk factors, joint pain can also be triggered by other more controllable habits and environments. Avoiding these habits and better managing one's reaction to these unhealthy environments may help to decrease the onset of joint pain symptoms. It's important to be able to recognize and understand the signs and symptoms of joint pain, in order to select the proper course of treatment for each individual. Continue reading to learn more about the signs and symptoms of joint pain. There are many medical signs and symptoms that can help to identify joint pain. Keep reading to learn more about these, as well as what to expect during a formal medical assessment. Beyond the physical symptoms of joint pain, there are also less obvious medical indicators that can be assessed by a doctor or healthcare professional. Estrogen level: Estrogen can cause hormonal imbalances, particularly during puberty, pregnancy, postpartum and menopause. 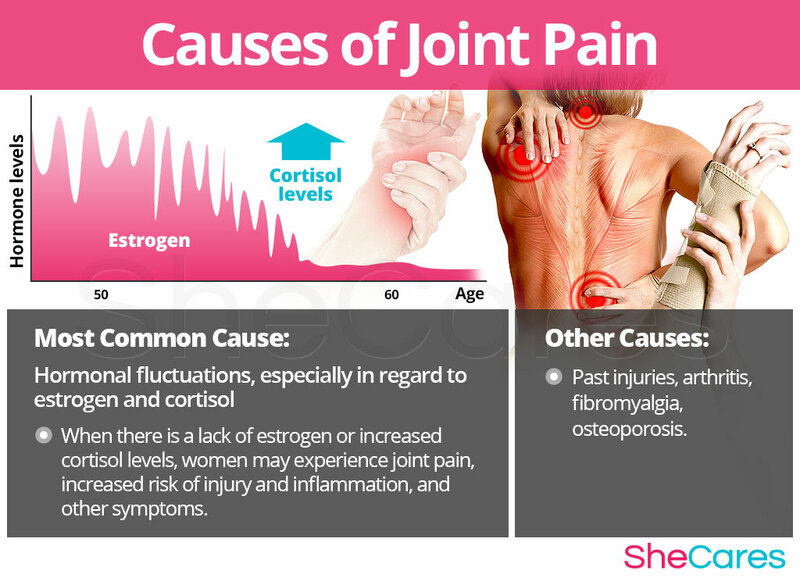 The fluctuating levels of estrogen in a woman's body during these phases may result in joint pain. If joint pain becomes uncontrollable, or may be caused by something other than hormones, it is advised to consult a physician, who can perform tests in order to properly treat the individual case. Keep reading to learn more about joint pain diagnosis and tests. A doctor will perform three procedures in order to diagnose and identify joint pain. They will review the patient's medical history, conduct a physical exam and finish with a psychological evaluation. If necessary, additional tests may be ordered. Patients may also be referred to a physical therapist or an orthopedic specialist, both of whom can prescribe individualized recovery plans for joint pain. Joint pain may occur at any stage in a woman's life, and is a condition that can worsen if left untreated. To ensure that joints don't become intolerably painful or immobile, joint pain should never be ignored. People experiencing joint pain should pace themselves according to what their individual bodies can handle, and should try not to perform any activity that may result in overexertion. For many people this will mean refraining from lifting heavy objects, running long distances or kneeling for extended periods of time. Mild cases of joint pain can occur as a natural part of the hormonal changes associated with a woman's menstrual cycle, and can be successfully managed at home. However, occasionally chronic joint pain caused by hormonal imbalance can interfere with a woman's quality of life. Complications including permanent joint damage, arthritis, weight gain and osteoarthritis have all been linked to joint pain, which is why addressing pain and identifying the root of the problem is essential, at the earliest stages possible. Continue reading to find out more about how to prevent and manage joint pain. Luckily for people suffering from joint pain, there are a number of behaviors that can help to prevent and manage this condition. 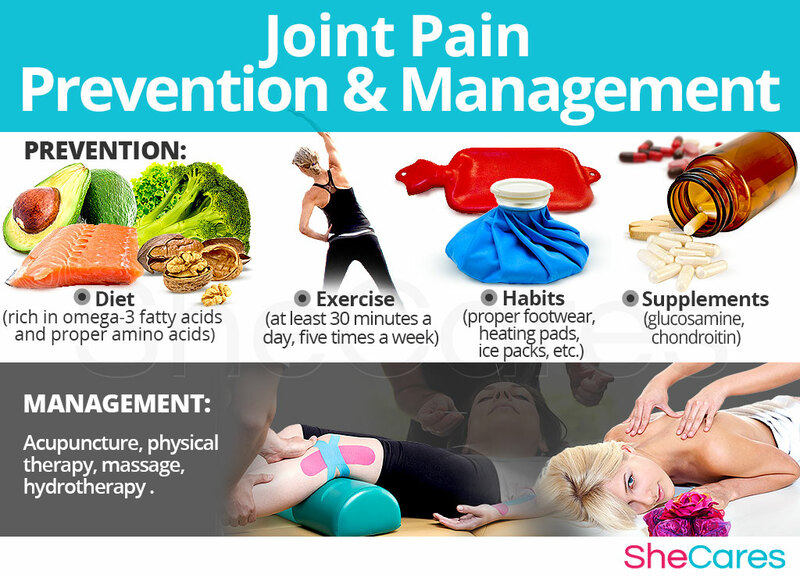 Diet, use of supplements, habits and exercise can all help to decrease the effects of joint pain. There are several coping strategies for people experiencing joint pain, and the same strategies can be used on both mild and chronic cases. It is important to treat any instance of joint pain and discover its cause because even mild cases, if left untreated, can lead to worsened conditions. Continue reading to learn more about joint pain treatments. Most herbal remedies can be purchased - or indeed created at home - in different preparations. For those who suffer with long-term joint pain, regular consumption of a tablet or capsule is often preferred. Alternatively, for the relief of joint pain in a localized area, application of a topical gel or cream might be the better option. In traditional Chinese medicine, acupuncture is highly regarded as a natural treatment for a number of ailments - including joint pain. If involves the application of thin needles to different areas of the body, for the purpose of influencing the body's energy, or Qi. Many women find acupuncture to be highly successful for joint pain relief. The treatment of joint pain, whether the case is mild or chronic, is essential in order to prevent it from becoming an ongoing problem. Treatment will be aimed at reducing pain and inflammation, and preserving joint function. The three ways to treat joint pain are (1) Lifestyle Changes, (2) Alternative Medicine and (3) Pharmaceutical Options. It is always recommended to start with the first line of treatments, which tends to be the least expensive and invasive, but often involves the most self-discipline. Start by keeping a journal to monitor occurrences of joint pain, including when it happens, how long it lasts, severity of pain, activities preceding pain, actions taken to relieve the pain and whether or not they were successful. If lifestyle changes alone are not effective in decreasing the intensity or frequency of joint pain, it may also be beneficial to incorporate alternative treatments into the daily routine. Alternative medicines and supplements involve minimal risk of side effects and can be very effective methods for treating joint pain. Phytoestrogenic and hormone-regulating supplements are the two different types of herbal supplements available to treat this condition. These supplements, such as black cohosh, contain estrogenic components produced by plants that complement the low estrogen hormones in a woman's body, helping to alleviate joint pain. By introducing plant-based estrogens into the body, these herbs treat the underlying estrogen deficiency behind joint pain. If neither lifestyle habits nor alternative treatments provide any relief from joint pain symptoms, it may be necessary to take drugs recommended by a healthcare professional. Naproxen sodium, ibuprofen, acetaminophen and aspirin are common drugs used to treat joint pain. This sort of treatment may cause side effects like burning or stinging, and should only be used under the supervision of a medical professional. For serious conditions, doctors may inject patients' joints with steroid medications every three to four months. This form of treatment is most common in patients who have inflammation, joint disease or arthritis. Injections have been known to provide relief for joint pain, but long-term side effects are not yet known. Side effects may occur as the result of taking any drugs. It is recommended to take drugs only when necessary, and under the advice and monitoring of a healthcare professional. A combination of alternative therapies and drugs seems to be the most effective solution to cases of chronic joint pain.